يقع في البحيرات الغربية, The Lakes Resort Hotel إنه المكان الأنسب لاكتشاف أديليد و ما يحيطها. يقع مركز المدينة على بعد 16.7km فقط. ويمكن الوصول إلى المطار خلال 15 دقيقة. إن سهولة الوصول من الفندق إلى المعالم السياحية الشهيرة الكثيرة في المدينة كمثل مدرج ايه ايه ام آي, Bartley Medical Centre West, Western Hospital Sports Medicine Practice هو استثنائي بحد ذاته. يعمل The Lakes Resort Hotel على ضمان إقامة مريحة لضيوفه من خلال خدماته الممتازة وحسن ضيافته. يمكن للنزلاء الاستمتاع بالميزات التالية: خدمة الغرف على مدار الساعة, خدمة التنظيف يوميًا, مجهز لذوي الإحتياجات الخاصة, مكتب الاستقبال على مدار الساعة, مرافق مخصصة لذوي الاحتياجات الخاصة أثناء إقامتهم في هذا المكان الرائع. يمكن للنزلاء الاختيار من ضمن مجموعة من الغرف المصممة بعناية لتعكس جواً من الراحة، والتي يتجاوز عددها 72. يقدم الفندق مجموعة واسعة من وسائل الراحة المتنوعة، كمثل: مركز للياقة البدنية, مسار جولف - ضمن 3 كم, حمام سباحة داخلي, سبا, بلياردو. إن كنت تتطلع إلى إقامة مريحة وهادئة في أديليد، فستجد في The Lakes Resort Hotel بيتك الثاني. Perfect in every way. Great accommodation tastefully appointed. Food in all restaurants is fabulous includes a yummy breakfast with plenty of choices. All staff are outstanding, pleasant and polite. Location with cinemas & shopping centre immediately across the road. Could live there no worries!! Cleanliness was good , however the swimming pool had black scum marks all around on the tiles and was a little off putting - could have done with a clean. My son is getting married there in September so was nice to come and have a look at the place. Great location with rooms overlooking the lake. Also had a good sized balcony to sit outside and enjoy the atmosphere. Breakfast was included. Nothing special but still enjoyable. Nice dining area, bar and pokies. We ate in Crusoes restaurant where we had excellent food and service. Great Staff in this establishment in all areas from Reception, housekeeping, to Bistro and Bar staff . All were friendly, relaxed and nothing was too much trouble - wonderful & refreshing! The room was warm, welcoming and very clean. A couple of carpet issues but they were being attended to. The bed was fabulous, soft but supportive and an array of pillows to choose from. Great Bar and array of drinks on offer. Ambience is relaxing and view is fabulous at sunset. Last but not least was the extensive smorgasbord breakfast included in your tariff. Chef will personally cook your eggs just how you like them, omelettes, pancakes, plus choices of the best mushrooms, crispy bacon and yummy frittata! Tons of choices with fruit, cereal, yoghurt, pastries and breads. Location is on the beautiful West Lakes and opposite the massive shopping centre. Free Parking is a huge bonus compared to CBD accommodation. On reflection I could live there - it was great !! The room is large with balcony for watching sunset and lake. There is a walking trail which we can enjoy the sunshine and breeze in the morning. Environment is excellent which we can relax ourselves. We had dinner and buffet breakfast which provide various choices and food quality is good. It is also near to airport which we took us about 20 mins drive. A spacious room which was spotlessly clean. The view is AMAZING, and the included breakfast very generous. 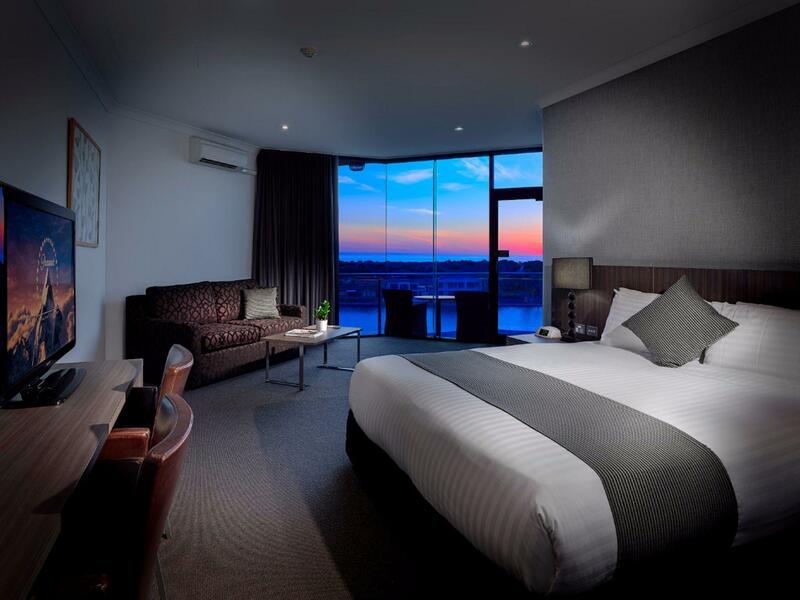 Location is very convenient for whatever you want to do in Adelaide. Highly recommended, I would have no hesitation in returning next time I am in town. Fantastic resort. Friendly staff. Big room overlooking lake. Buffet breakfast included in price. Number of dining options. Nice bar. Large shopping centre across road. Would recommend for a quiet getaway. Gourgeous room with really comfortable beds, relaxing spa, luxurious bathroom, big balcony with breathtaking views, fun bars and restaurants within hotel. Huge shopping centre across the road. The indoor pool is nice and warm, staff really friendly and convenient free parking onsite. We celebrated our 23rd wedding anniversary here, we also got engaged here and spent our honeymoon here at this magnificent hotel and are never disappointed. Will return again soon and highly recommend to all. I cannot praise this place enough! Gorgeous and clean hotel with the most beautiful and lovely staff. We have a stunning view from our bed and balcony and the food (dinner and buffet breakfast) was beyond amazing. We will DEFINITELY be here every year for our anniversary. We had friends come for dinner and drinks and a couple ended up booking a room and staying also. Everyone raved about this place. Have stayed before and really enjoyed the hotel. We didnt want to go out to eat and went to the bistro with friends joining us and then other friends joined us for breakfast, we had a lovely meal and a great atmosphere. It is close to everywhere and the view is amazing. Highly recommended. Nice and serene stay overlooking the lake. I have stayed at Lakes Resort Hotel often, I like the location. Stay here often, very convenient. Nice view of the west lake from the room. Good buffet breakfast, comfortable bed, nice shower and nice amenities. Gym is outdated, pool area has basic but functional. parking is problematic as one has to compete with general public. They wanted to charge us for extra fake milk for morning coffee. 5 small tubs were enough apparently for two people, who had a cuppa the night before and like two cuppas in the morning each, given the tiny cups for a wake up cuppa. I have never been refused extra milk before.